These "Pleasure Pumps" appear to have an accurate name. They are pleasure to look at. They would be a pleasure to wear. They would even bring pleasure to people who saw them walking down the street. These satin and patent leather pumps from Carlos by Carlos Santana come in Aqua (pictured) and red. The print is quite different in each color, but equally lovely. 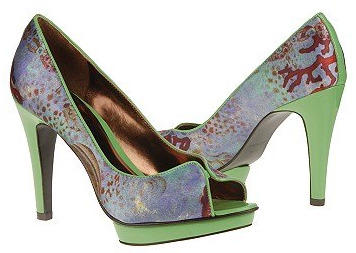 These classic, print pumps will add the perfect pop to many outfits for years to come. Snag these pleasurable shoes for $99 at Shoes.com. WANT!!!!!!! I found them on sale a few other places too.